As a major global player UPM takes the responsibility to provide sustainable solutions for the label industry. The UPM Raflatac Label Life tool and the RafCycle® program are examples of such solutions that help you improve your company’s sustainability. We would like to introduce you to these tools that can support your business in becoming more sustainable. First some facts: Did you know that out of all the plastics consumed in the EU about 40% goes to the packaging industry, which due to its short life cycle creates about 15 million tons of plastic waste per year. Roughly 33% of this waste is being recycled with the remainder being landfilled or incinerated. But more than half of the plastic waste generated can be fully recycled when sorted correctly. With the RafCycle program we support your goal to increase recycling rates and reduce landfilling. UPM Raflatac’s RafCycle waste management program makes use of label stock by-products from all stages of the label’s lifecycle. Label waste material is given a new life as UPM ProFi composite products, UPM magazine paper or as an energy source for UPM paper production. 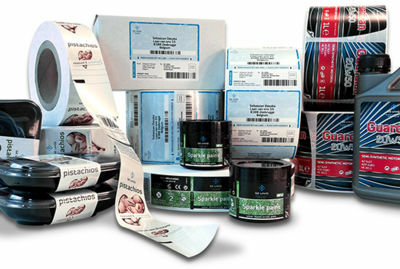 This improves the environmental performance of your label’s lifecycle. The main factors that can improve the environmental performance of a label are the selection of raw materials and the end-of-life treatment options. Let’s first have a closer look at the end-of-life option for glassine release liner. At UPM Plattling paper mill the recovered glassine release liner is being re-pulped in a water-based solution which releases the silicone from the fibres, and the de-inking flotation process removes the released silicone particles. What used to be waste now becomes raw material. The magazine paper coming out of the UPM Plattling mill has an average recycled glassine content of 20%. The second factor that influences a label’s environmental performance is the material type chosen in addition to the material gauge and weight. We know that thinner materials use less resources and allow for more labels, longer rolls, higher production efficiency and reduce transportation impacts. 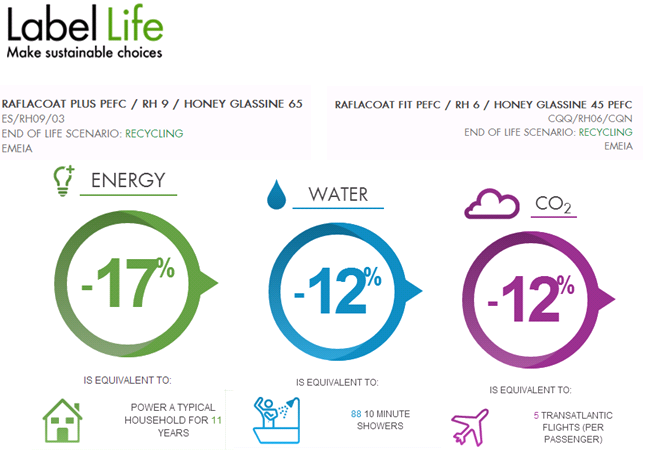 But with UPM Raflatac’s Label Life tool we can actually show these savings in a clear and standardized way based on the ISO 14040/14044 standard. Let’s compare a standard Raflacoat Plus PEFC™ certified product (ES/RH09/03) with a Raflacoat FIT product (CQQ/RH06/CQN) for a volume of 100.000 m2, both products being recycled at their end-of-life. The FIT product gives 17% savings on energy, with a 12% reduction for water and CO2. When we relate these absolute savings to everyday use we get an understanding on the impact reduction. The energy savings are equal to the electricity used for 11 years by an average household, water savings are equal to 88 ten minute showers and the CO2 reduction equals to 5 transatlantic flights. These are considerable savings that improve the sustainability of your product and can be shown to your customer in an easy way. We make these calculations based on the Life Cycle Analysis (LCA) method helping converters and end-users make informed decisions and contribute to smart choices. When aiming to sustainable cost competitiveness, it is essential to select raw materials carefully and to use those materials that are fit for purpose.